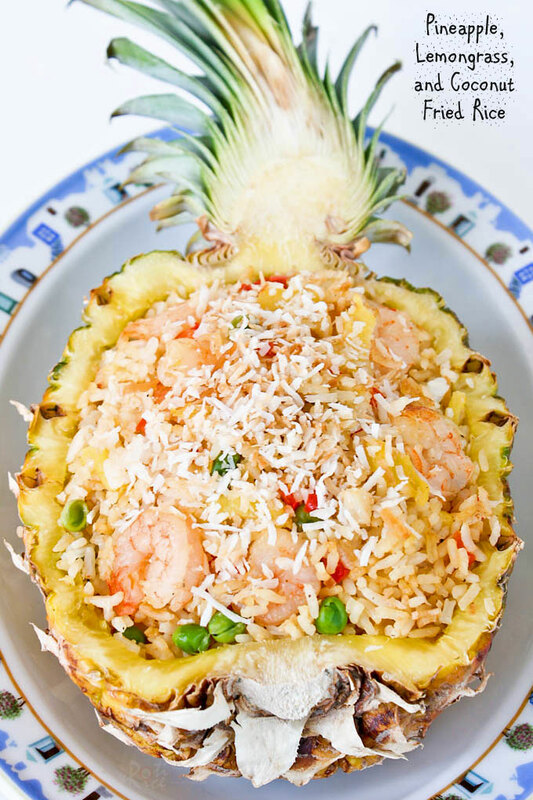 Jazzed up Pineapple, Lemongrass, and Coconut Fried Rice served in a pineapple boat for a truly Southeast Asian flavor. Very fragrant and delicious! I seldom buy pineapples because I often end up having to eat more than half the fruit myself. I would not have minded it as much if the pineapples were sweet, but sadly that wasn’t always the case. I recently bought one as I was craving rojak, hence the Spicy Chocolate Rojak. That pineapple from Costa Rica was really sweet. I am hooked! Knowing that I will not be able to use the entire fruit for the rojak, I thought about using the other half for this Pineapple, Lemongrass, and Coconut Fried Rice. It worked out really well as there was enough pineapples for the two dishes and a little left over for snacking. I jazzed up the fried rice with lemongrass and pan fried coconut flakes, giving it a truly Southeast Asian flavor. Ro-Ri San and I enjoyed the dish but the taste was a little too exotic for the boys. They did, however, liked the presentation. 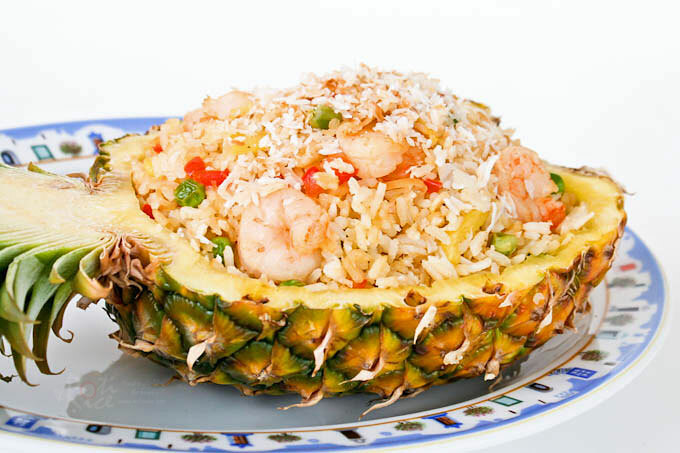 If you are planning to use the pineapple shell to serve the rice, carefully slice the fruit in half lengthwise. 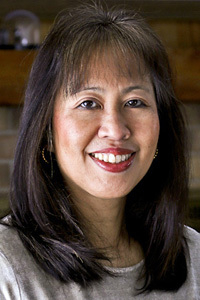 Cut around the skin with a small paring knife, leaving about half an inch of flesh. Make several hash cuts on the flesh so that it can be easily scooped up with a spoon. In a small fry pan, dry fry coconut flakes until fragrant and lightly browned. Remove and set aside. Heat vegetable oil in a large pan. Add lemongrass and garlic. Sauté till fragrant, about 2 minutes. Stir in garlic chili sauce, pineapples, shrimps, red bell pepper, and frozen peas. Cook for about 3 minutes or until shrimps turn pink and start to curl. Add rice, soy sauce, salt and pepper. Stir till well combined and rice is dry, about 3 to 4 minutes. Turn off heat. Sprinkle coconut flakes on the top. Stir to mix it in. loved the shot of rice in the pineapple- really innovative! Recipe looks vibrant and I will love to try it without the shrimps! Wow Biren this is stunning! I love pineapple and feel the same way about getting a whole one. I also have a hard time throwing away the tops…I now have several pineapple plants growing in my yard and a few in pots (they’ll fruit sooner). It’s such a disappointment when they just don’t have the flavor (I usually smell them before I buy them to make sure they smell like sweet pineapple). Fried rice is a favorite here because you can use anything in it…yours is fantastic! It is wonderful that you can grow your own pineapples. I am excited for you. 🙂 I hope they turn out super sweet. Fried rice is so tasty and easy to make. You can throw almost anything init and it will taste good. I also always end up eating that pineapple – this has got to be one of the best fried rice ever. So wish I had some. This looks gorgeous and so delicious, Biren! I want some…:D)! Beautiful clicks. The rice looks very colourful and tasty. love the presentation and the toasted coconut flakes. Oh my goodness, this looks SOOOO good! Reminds me of when I was a child eating at my grandparent’s house! LOVE IT! Biren, I love everything about this dish; the presentation, the flavors, and the simplicity. The hardest part would be cutting the pineapple for me. I’m actually slightly allergic to pineapples, but this looks so good I have to try. I’m going to bookmark this. Thank you for sharing with us. Have a lovely weekend. Cutting the pineapple is the most time consuming part. The rest is pretty easy. Perhaps you can get your hubby to cut it for you. 😉 You have a great weekend as well. What a beautiful presentation Biren! The rice looks wonderful! I love the fresh and exotic flavors you incorporated. This must be very delicious and good! This fried rice sounds amazing, I love the lemongrass here! Beautiful presentation in the pineapple shell! 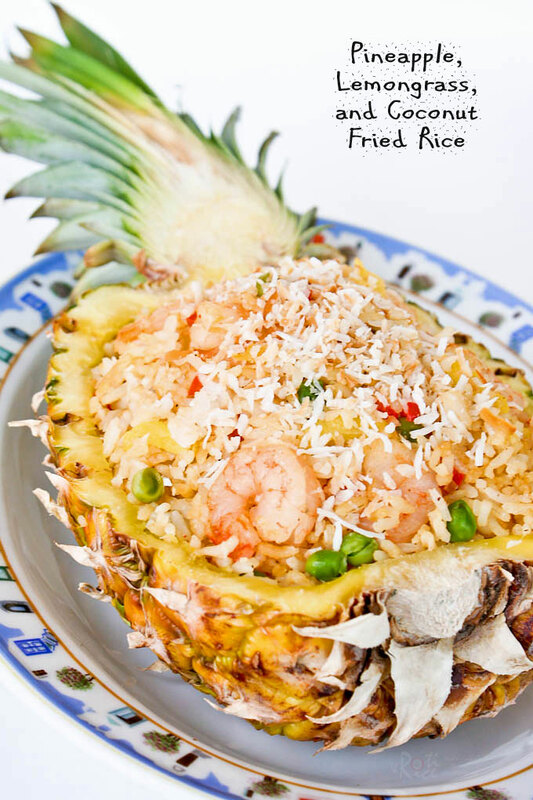 Biren, Love your creation on the pineapple fried rice with the addition of coconut flakes. I bet it must be very delicious 🙂 I love pineapple too especially the ones from Sarawak and Philippine. They are really sweet and juicy. I love the presentation of this dish! Served in the pineapple shell, it really is both aesthetically pleasing AND delicious! Stunning presentation, just as one would find from a magazine! Looks really good. Have not eaten pineapple fried rice in a while, now I’m craving for some! Aww…thank you! 🙂 I have not had pineapple rice for a while and I am glad I made it. The lemongrass and kerisik made it very fragrant and tasty. What a beautifully presented rice dish! I love your blog and nominated you for the stylish blog award. My, this is really gorgeous! Yours look so yummy because it isn’t oily. Good clicks too! This is always a favourite of mine! Love that your added lemongrass and coconut in the rice. Oh my goodness this rice looks so delish! Really wonderful recipe, I must try this soon! What a pretty dish! I love the sweet pineapple and am drooling right now! I have the opposite problem – pineapple is so popular at our house, there is hardly ever any left over to do anything with! I don’t think I have ever made pineapple fried rice at home for this reason 😀 This does look very festive, colourful and tropical. I love the addition of lemongrass and crisp coconut! What an exquisite and refreshing pineapple rice dish, or I would even serve it as a beautiful rice salad. So colorful, light, and refreshing. Biren, I love the creativity of this elegant dish, and the presentation is “out of this world”, gorgeous! I love the presentation too! Love the novelty of eating out of a real pineapple bowl:D Never failed to order this dish whenever we eat out at a Thai restaurant. Looks delicious! I did try to save the shell to do this but it was a total disaster. I did a fried rice without the lemongrass and kerisik – what an excellent idea. I will attempt this again as I do have another Costa Rican pineapple sitting on my kitchen counter. The last one was simply delicious and sickeningly sweet! Oh my…what happened! You have to use a paring knife to cut around the edges leaving about a half inch of flesh. Then make several cross hashes so that you can scoop or gently cut out the flesh. Do give it another try. 🙂 The lemongrass and kerisik made the rice really fragrant. Yum yum Biren! This isn’t too exotic for me. I’d gobble up an entire pineapple half’s worth no problem! Not only is this beautiful but it looks tasty too! I love the idea of using a pineapple as a bowl. This must be absolutely delicious! And look at that gorgeous presentation! Wow! How perfect for a party :-).